Mr. Peter Hain (Neath) (Lab): May I say how delighted I am to see you, Madam Deputy Speaker, as a great Welsh woman presiding over this debate? May I also express my gratitude to my right hon. Friend the Secretary of State for what he said about me? I congratulate him on getting the job, despite the surreal, nightmarish circumstances in which I left it. I cannot think of anyone whom I would more like to see holding the post. I replaced him in Wales and in Northern Ireland, and now he has replaced me in Wales. Things are becoming almost politically incestuous. I am also grateful to the hon. Member for Chesham and Amersham (Mrs. Gillan), who has always shown great decency in all the jobs that we have worked on together. Over the past 11 years, the Welsh economy has been transformed, because of the energy, innovation and dynamism of Welsh businesses, and the skill and hard work of Welsh women and men, combined with the unprecedented annual rises in public investment and economic stability ensured by our Government. Economically and culturally, Wales has enjoyed a renaissance, after the grim decades of mass unemployment and business failure. We should all celebrate that because, working together, we—our Labour Governments in Westminster and Cardiff, business and all Welsh employees—have made it possible for Wales to walk tall with a spring in our step. However, we are still nothing like where we should be to compete with the competition from eastern and central Europe, let alone from the emerging Asian economies and especially our new global economic partners and the superpowers of the future, China and India—countries of more than 2 billion people, producing 5 million new university graduates a year, two thirds of whom are graduates in science, technology, and information and communications technology. The central challenge that we face is to transform the Welsh economy by building a much bigger private sector. Unless we do that, we will not be able to achieve the world class success that Wales is capable of and deserves. 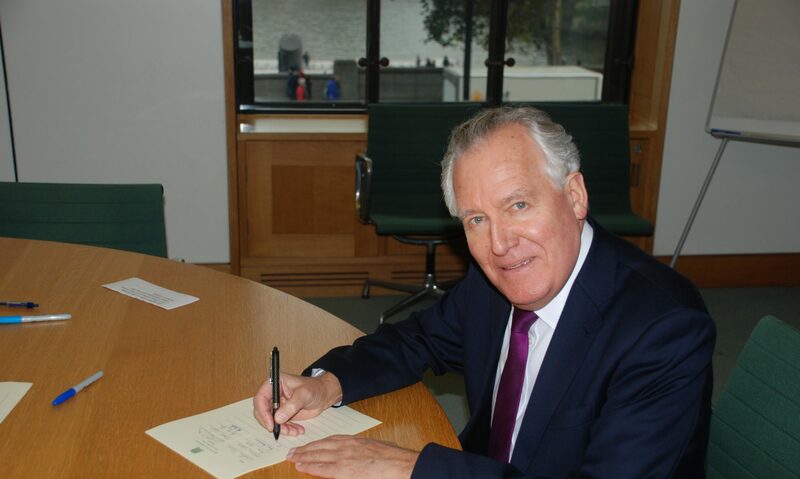 If I may say so, Madam Deputy Speaker, I have set out these ideas and the argument in more detail on my website, www.peterhain.org. They will also be published as an internet pamphlet, at www.wales2020.com. One of the elements essential to Wales’s success to date has been the huge real-terms rises in public investment, with the Welsh budget increasing to almost £16 billion by 2011, some 130 per cent. higher in cash terms than in 1997. But that era is coming to an end. Britain has never had a period of such long and consistent steeply rising public spending. However, that cannot continue without unbalancing the economy, causing a return to the instability, high inflation and high interest rates that we inherited from the Conservatives and that plagued all British Governments for a generation and more. That is why the next comprehensive spending review period, from 2008 to 2011, will still see real-terms increases in public investment, but at a lower rate. That poses challenges for the Welsh Assembly Government, because their entire life has so far been spent under the umbrella of unparalleled real-terms budget increases. From now on, the kind of efficiency measures and reforms that Minister for Finance Andrew Davies is rightly insisting upon will be needed to reduce inefficiency and bureaucracy, and release funds significantly to improve front-line services. It will also be necessary to exercise much tougher choices over priorities. Those who claim that the Government’s public spending programme has inhibited the growth of the private sector are wrong. Huge public investment in private construction, for example, has stimulated it, while five times more Welsh private sector jobs have been created in the past 11 years than in the public sector. There are many other sectors in which Welsh businesses have themselves benefited and created Welsh jobs by providing services or selling products to the Welsh public sector on the back of rising spending since 1997. That is a stark contrast with the economic instability and public spending cuts experienced from 1979 to 1997, when huge numbers of Welsh businesses went bankrupt and unemployment soared. However, according to the Library, estimates show that public spending in Wales is equivalent to 59 per cent. of gross domestic product. The figure for Wales is higher than any other part of the UK except Northern Ireland, where it is 64 per cent., although the figure in north-east England is similar. The equivalent estimate for Scotland is about 50 per cent., while the UK average is about 44 per cent. Wales’s ratio of public spending to GDP is broadly similar to, or perhaps slightly higher than, the highest ratio among OECD countries. In Wales, 23.7 per cent. of employees are in the public sector, compared with the UK average of 20.2 per cent. Again, that is similar to the figure for the north-east, but lower than the figure for Northern Ireland, at 29.1 per cent. All other areas of the UK have lower shares of public sector employment. Public spending is high partly to correct the legacy of historically high levels of relative deprivation, of sparsity, of geographic remoteness, and of the ill health that is a legacy of Wales’s industrial heritage, especially mining. Moreover, our Government have, rightly, been deliberately moving public jobs from the overheated south-east to Wales. The argument that I make is therefore emphatically not for the cuts in public spending so beloved of the right, still less that the public sector in Wales is too big. Indeed, I am arguing the exact opposite. The real issue is that the private sector is too small. If both Welsh living standards and the economic competitiveness that underpins our prosperity are to grow as we all want, the private sector needs to grow significantly and at a relatively much faster rate. To achieve at least equilibrium with the rest of the UK and the OECD countries, Wales must move towards a private sector of around 55 per cent. of Welsh GDP. To achieve that in the next 15 to 20 years, we will need year-on-year growth that is around 1 per cent. faster than the UK average—no mean feat. It is no good simply leaving the task of catch-up to market forces and the private sector, as the right insists. They have a critical role to play, of course, but so does the Government in London and Cardiff, by targeting public investment not only on the “soft” side of public spending—that is, on care and services—but on the “sharp” side, on skills, infrastructure, technology, research and entrepreneurialism. At the height of the industrial revolution 150 years ago, Wales had in Merthyr Tydfil what was considered the most technologically advanced town on the planet, with the most productive ironworks in the world and the development of the first rail engine. We now need new Merthyrs for this century, leading the way in the new technologies of the future. Although we need higher labour productivity, Wales cannot and should not try to compete on cheaper labour costs, with China and India, for example, paying manufacturing workers just 60p an hour. As Rhodri Morgan has so eloquently said—and as the Secretary of State repeated—the Wales of the future will be a “small but clever country”, with private sector growth in the right areas, and raised levels of educational attainment, skills and innovation to add value. At present, although Welsh spending on research and development is rising, it remains too low, and this must be addressed urgently, with ever closer partnership between—and ever more targeted spending by—the Governments at Westminster and Cardiff, our universities, colleges and Welsh businesses. Our vision is for a Wales that acts as a centre where companies can innovate in partnership with our educational institutions. I identify seven immediate priorities. First, we must secure graduate retention, develop technical skills and inspire entrepreneurship from school upwards. Secondly, we must make tough public spending decisions, with a moratorium on handouts and a switch to supporting greater competitiveness. Thirdly, we must compete in the high added-value areas such as financial services, electronics, nanotechnology, biosciences, molecular mechanics and information and communications technology, with many more start-ups and high-tech businesses. Fourthly, we must support vital new energies, including renewables and biofuels. Fifthly, we need to support our economy with a welfare system that gets people off benefit and into work, and provides our work force with the skills that they need to progress in employment. Sixthly, we need to ensure that we have a political, economic and social culture in Wales that is truly internationalist. Finally, we need smarter government, local and national, with a more dynamic Welsh public service. Universities need to be at the heart of our economic growth. And that can be done, as Singapore, a country roughly the same size as Wales, has demonstrated: on a per capita income basis, it is now one of the top 20 countries in the world. Our universities are already making a significant contribution to business, and substantial increases in the Government’s science and innovation budgets are enabling them to improve this still further, as I have seen myself during visits to Cardiff, Swansea and Bangor universities, for example. I have also visited the North East Wales institute of higher education—NEWI—in Wrexham, and I look forward to its getting its university status. The emergence of techniums throughout Wales is hugely important in exploiting the talents of Welsh graduates to enable them to start up new companies, and in providing excellence for the knowledge economy that is our future with new, world-class employment opportunities for young skilled people, whether from Wales or elsewhere, especially in growing and important areas such as financial services, nanotechnology, biosciences and ICT. By inspiring our young people, we can add to the natural desire to succeed that is already there. The Government need to prioritise funding to enable our universities, colleges and schools to provide much better foundations and opportunities for these potential business men and women of tomorrow, to enable them to go on to realise their aspirations. Wales has an abundance of natural resources, with a coastline and landscape that lends itself to a variety of offshore and onshore wind and other renewable energy developments, including wave and tidal. The Government are moving forward with a feasibility study into the potential for a barrage across the Severn estuary that would generate fully 5 per cent. of UK electricity needs. It would be the biggest renewable energy project by some distance on our island, creating tens of thousands jobs, first in construction, then permanently. There is also a potential for growth in the Welsh coal industry, but that will not, and should not, happen unless Welsh coal becomes green coal. The Governments in Westminster and Cardiff should work together to develop innovative carbon capture and storage procedures, as well as ensuring that we have clean coal power stations and realising the enormous benefits that could be gained by exporting to countries such as India and China. Although new technologies and back-up services are the source of potentially huge numbers of new Welsh jobs, there are currently some 50,000 vacancies across Wales, because we do not have enough people with the right skills or because they are not being given the right support to fill the vacancies. We need to move tens of thousands more people off benefits and into work, tailoring support to their needs. Opportunities should be maximised by Jobcentre Plus in Wales and by the Welsh Assembly Government to match European convergence funding and to create many more new skills and job preparation schemes in west Wales and the valleys. Despite having come down in the past few years, the level of economic inactivity is still far too high in Wales, reflecting the dismal heritage of the 1980s and 1990s, when the number of people on incapacity benefits more than trebled and mass unemployment was a curse. When I say that the majority of people on incapacity benefit could work, and should work, it is not an attack on them. It is an attack on an outdated system that deprives them of the opportunity to share in the rewards of work that go far beyond financial independence, important though that is. Work is inherently good for people of all ages. It is good for their health, good for families and good for communities. Clearly, government at all levels will have to raise its game. Decisions need to be taken more quickly and the Government’s streamlining of planning for infrastructure and energy projects is vital to overcome endemic nimbyism. This is certainly not about riding roughshod over local views, however. It is about grasping the nettle and acknowledging that strategic policies need to be implemented much more quickly if Wales is not to fall further behind. Business also needs much smarter local government, modelled, I believe, on Neath Port Talbot council’s record of excellence for quick decisions, implemented speedily. The culture of cautious conservatism that is so rife in Welsh public services—from the civil service to local councils—needs radical reform if we are to build a truly competitive economy. As I know from working with them, there are many fine Welsh public servants, including in the Wales Office. But, for Wales to succeed, our risk-averse, can’t-do culture must be replaced by a dynamic, can-do culture. Wales continues to improve, but we cannot stand still. The alternative is to fall back. We must think and act globally, not merely nationally. We must be a small country with a big global vision. Using all our institutions and talents, we must make the most of new skills, new technologies and new opportunities. We must re-prioritise our public spending to prioritise sharp rather than soft services, favouring skills, technological innovation and business support rather than free schemes. We must also rapidly grow the private sector so that it overtakes the public sector in size and creates a vibrant, more balanced economy and an even brighter, stronger future for a Wales that is reaching up to be genuinely world class. Entering the House after the high profile of a by-election is rather like having been head prefect in primary school, only to be plunged into the obscure anonymity of a secondary school new boy. I am confident that that fate awaits me when I sit down today. It is an honour and a privilege to represent Neath, or Castell Nedd, whose importance dates from Roman and Norman times, and which has the cosiest town centre in Britain, surrounded by scenic valleys and majestic waterfalls, with, to the west, the a spectacular night-time view of Pontardawe’s unusually tall and striking church spire. There is a strong sense of community, an immense network of voluntary activity, and a rich culture of amateur opera, music, and male voice and ladies’ choirs. On the eastern tip of the constituency is Richard Burton’s home village of Pontrhydyfen. Amateur sport is widespread—football, athletics and, of course, the best rugby team in country. Recently I was introduced to a class of nine-year-old children at Godrergraig primary school. The teacher said, “Here is a very important person.” One of the nine-year-olds got up and asked, “Do you play rugby for Neath?” That, I thought, was a man who had his priorities right. I have enjoyed renewing my interests in the game at Neath’s home ground, the Gnoll. In my youth, that interest involved running on rugby pitches, both as a player and, later, in another capacity, which I shall refrain from describing, as this speech is made with your indulgence, Mr. Deputy Speaker. I am privileged in another way: I follow two Members, both survived by wives still living in Neath. Margaret Coleman is a highly respected figure in her own right in the community. Jenny Williams, now in her nineties, was a much-loved Labour party activist, and wife of D. J. Williams, who hailed from the close-knit village of Tairgwaith in the north-west of the constituency. In 1925, D. J. Williams wrote of the destructive impact of capitalism in the coal industry in terms that remain true today. Donald Coleman’s tragically premature death was not just a bitter blow to his family; it deprived Neath of a favourite son, and this House of its finest tenor. Although I will do my best to follow in his footsteps as a diligent constituency MP, I am afraid I cannot hope to match his talent for music and song. The exuberance with which he sang and preached his love for Neath reflects the intense civic pride in the town and in the villages of the Dulais, Swansea, Amman, Neath and Pelenna valleys. But local residents cannot survive on civic pride, mutual aid and mutual co-operation alone. They take great pride in educational achievement. I have met nobody in Neath who cannot remember how many O-levels he or she has. There is a great tradition of skill and hard work in Neath and its valleys. Much has been done in the face of Government indifference and neglect, but so much more could be done if the publicly sponsored investment in industry, infrastructure and initiative for which the people of Neath and its valleys are crying out were provided. Surely Neath is entitled to the seedcorn investment, decent training provision and long-term loan finance that only national Government or the Welsh Office is able to provide. The old Blaenant colliery site —headgear still erect as a monument to the last pit in Neath; one of over 30 to close in the constituency in the last 30 years —nestles beneath the village of Crynant in the picturesque Dulais valley. The old Aberpergwm washery and pit site is just below the little village of Cwmgwrach in the Vale of Neath. Both are prime industrial sites, yet both stand idle, black and gaunt, their potential wasting away as 11 people chase every job vacancy, training places are cut to the bone, and businesses go bust. Nobody in Neath wants a free ride. People want simply the opportunity to build a new future. That future must include high-quality health and community care provision. With its history of mining and heavy industry, the people of Neath suffer disproportionately from ill health. With a higher than average proportion of citizens of pensionable age—22 per cent. compared to 17.7 per cent. for Great Britain —there is a particular need for a properly funded health and community care network. Yet the Welsh Office and the Treasury have still not given the go-ahead for the new hospital that Neath so desperately needs, and West Glamorgan county council has been forced, under pain of poll tax capping, to close one of its old people’s homes. Neath borough council, meanwhile, has had to spend an extra £523,000 on collecting the poll tax, compared with the cost of collecting the rates. On top of this, the borough had to install a new computer system for processsing the poll tax, at a cost of £300,000. Neath’s 16,000 pensioners are entitled to question the priorities of a society and a Government that waste such colossal sums of money while hospital waiting lists grow, and responsibility for community care is unceremoniously dumped on local authorities without the necessary resources to finance it. How can we claim to be caring for citizens in need when the iniquity of the poll tax continues to penalise them so savagely? Even after the recent £140 reduction in the poll tax, residents in the Blaenhonddan area of Neath will be paying £113.66 a head. This is £85 more, incidentally, than I pay as a resident in Resolven, a few miles up the Neath valley, even though we are paying for the same local authority services, because of the discriminatory way the Welsh Office operates the transitional relief scheme. One resident in the Blaenhonddan area—a woman from Bryncoch—is caring for her 83-year-old mother who has Parkinson’s disease. The mother has a tiny widow’s pension and has to pay the full £113. Their combined household poll tax bill is £339, yet both she and her husband are on tiny incomes which are so widespread in the Neath area. The hypocrisy of preaching community care while practising such a pernicious policy is not lost on that woman or her neighbours in Neath. Conservative Members who turn a blind eye to her predicament call to mind Thomas Paine’s summer soldier and sunshine patriot who in a crisis shrink from the service of their country. How can the House claim to be safeguarding the interests of individuals such as a 72-year-old man from the village of Gwaun-cae-Gurwen, where the Welsh language is spoken with pride, whose eyesight deteriorates daily? He has waited 18 months for a cataract operation—a simple, cheap operation. Yet waiting lists for ophthalmic surgery at Singleton hospital have doubled since 1987, and there are now 1,400 local people like him awaiting in-patient treatment. Perhaps most outrageous of all, he was told that he could have the operation next week if he could go private at a cost of £3,000. He might as well have been invited to go to the moon, for that is a sum quite out of the question for someone living on the pittance that pensioners get today. He can be forgiven for noting with anger the grotesque fact that 200 people, just 0.0004 per cent. of the population, now monopolise 9.3 per cent. of the country’s economic wealth—some classless society indeed. Meanwhile, the quality of the environment and the standard of living continue to deteriorate, especially for our elderly. Local bus services in the Neath valleys have been cut ruthlessly. Fares are exorbitant. Yet who can afford a car on a basic retirement income, perhaps topped up by a miner’s tiny pension? It is difficult enough for senior citizens to pay their colour television licence and the standing charges on their phone, electricity or gas. It is difficult enough for them to find the money to eat properly as food bills rise remorselessly while the real value of pensions declines compared with wage earners. If Neath’s senior citizens had free bus passes, if standing charges on basic utility services were reduced or abolished for pensioners, if those on low incomes were entitled, like their colleagues in sheltered housing, to television licences for £5 rather than £77, if Neath and Lliw borough councils were not banned by the Government from using their combined housing capital receipts of £7.6 million to build new homes and hit by cuts in housing funding from installing universal central heating and upgrading their existing housing stock, if communities like Cwmllynfell at the heads of the four main valleys in the constituency were not choked by coal dust, disruption and heavy lorry traffic from existing and threatened opencast mines—if all those vital factors were addressed, the standard and quality of life of my constituents would be dramatically improved and, with it, there would be less need to depend upon health and community care provision. Furthermore, if the curse of “London knows best” were removed, local people would of their own volition radically recast their priorities. That is why decentralisation of power through newly invigorated local councils and an elected assembly for Wales are so vital. That is why a freedom of information Act and an elected second Chamber are so essential. The voice of the people must be heard, not smothered by anachronistic and elitist institutions of Government. During the last 12 years especially, Britain has become an “I’m all right, Jack” society, putting instant consumption before long-term investment, selfish “mefirstism” before community care, and private greed before the public good. The result is ugly to behold: the tawdry tinsel of decadence camouflaging a society rotten at the roots.